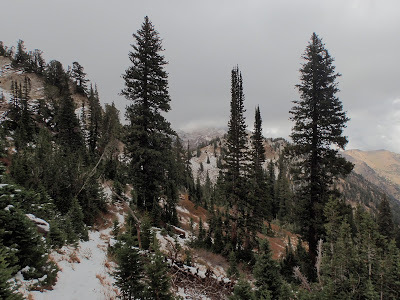 Deseret Peak is an infrequently visited massif just west of Salt Lake City and valley. Its a steep 8 mile hike that is easily done in a day. 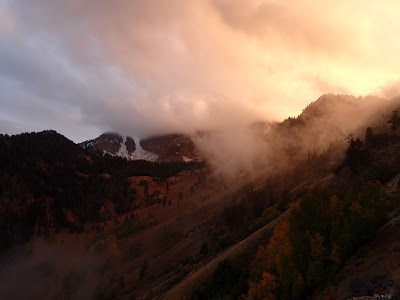 Although only 30 miles from the Wasatch Front Range metro area, its a much emptier alternative to the more famous mountains that overlook the valley. Its a wonder how I've managed to go nearly 5 years now without climbing a mountain greater than 10,000 ft. In fact, the last mountain I climbed that was greater than any east coast height was Mt Eddy in Northern California at just about 9,000' even. This isn't to say that I've been lacking in adventures but its been too long since I've had a western alpine experience. For 5 days, I've been drifting around Utah and Nevada getting all that wonderful thin air back in my system which has been rejuvenating. 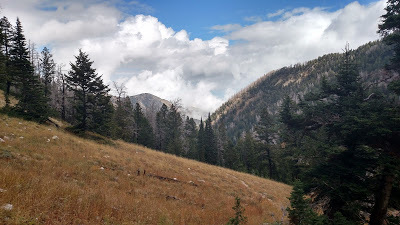 The first destination was Deseret Peak and Wilderness. After getting off the plane in Salt Lake City International, I was greeted by the welcome site of distant snow-capped peaks. 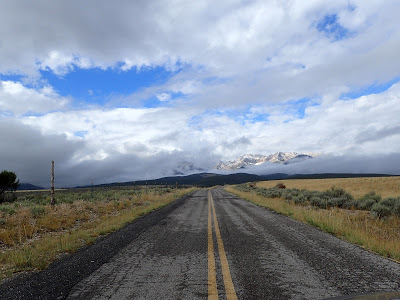 Even this early in September, winter comes quite early in the high summits of the Rockies and Great Basin. 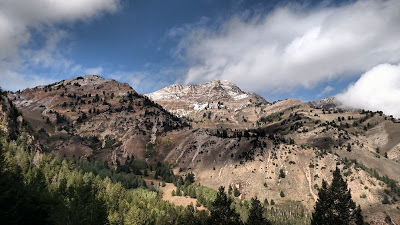 Deseret peak stands at 11,026 ft and would be snow-capped this warm, late-summer day. While this would certainly lead to some interesting navigation, I was thrilled to be here during autumn colors. The last three years in New England have made me a connoisseur of fall brilliance and this part of the country would not disappoint me. 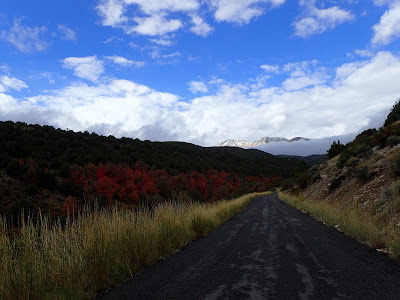 Even driving up the dirt road to the parking area had all the colors of an artist's palette. Reaching the trailhead, I was finally greeted with a sign I haven't seen in a very long time. A classic, rounded, oblong pentagon which is hardly ever seen in the Midwest denoting "wilderness". A warm feeling of contentment came over me as I crossed the invisible line. 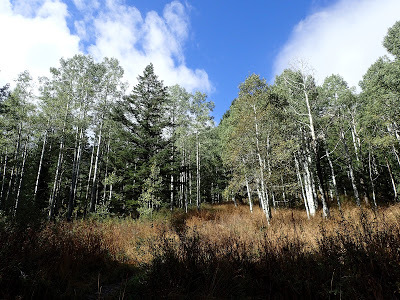 The first part of the hike is through alpine forests which are turning a bright yellow this time of year. The trail also runs through several scrubby open meadows which are equally beautiful. Now above the clouds, the mountains rose out of the fog almost the way land rises from the sea. This trail gains a significant amount of elevation over about 4 miles and there are rarely flat sections. I almost forgot how slow the pace can be at the higher elevations and I plodded along slowly. This wasn't drudgery however, I was able to more fully take in this rare scenery. 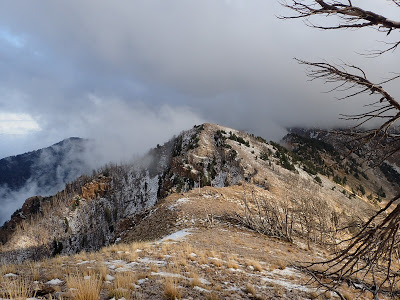 Utah's western ranges are where the dry, high desert ranges of the Great Basin meet the even higher but more temperate mountains of the Rockies. It makes for an interesting mix of environments with traces of each biome abounding. Flora is abundant but stunted by the higher and dryer climate of this harsh area. Some have the appearance of being dead when in fact the greater organism is still very much alive. Grizzled pines dotted the landscape as if each had their own subdivision. After hiking so much in the densely wooded boreal forests of New England, this area stood in stark contrast. After switch-backing up to the ridge line, the trail still gains more elevation but at a less grueling pace. 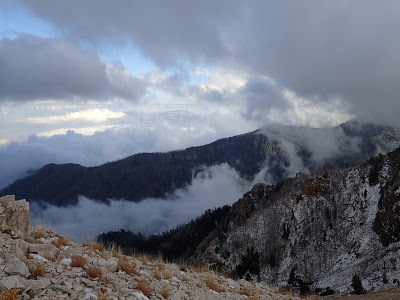 By this time, I was completely in the clouds which made for an ethereal walk. There were no trees and only faint signs of small plants here and there. With no wind, no animals and 25,000 acres of wilderness essentially to myself, a strange silence prevailed. 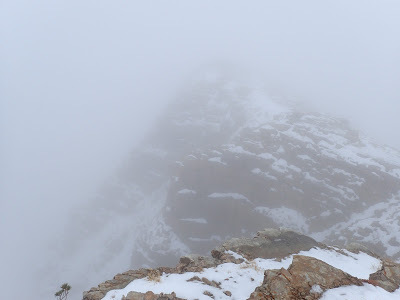 At one point the fog became so dense that it was hard to say whether I'd actually crossed the mountain's apex. My altimeter read somewhere in the range of 12,000 ft and the head-wall above looked faintly similar to the more famous pictures of this summit. After a big of searching around, I found the summit canister and confirmed my location. Ambient temperature was close to 31 degrees and as you can see from the pictures, winter wasn't far away. It was a marvelous feeling to be so alone and so far away from anything even remotely suggestive of civilization. 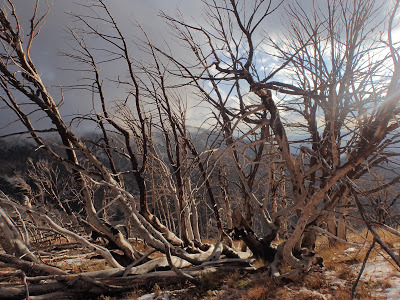 The summit stands less than 50 miles away from a metro area of 1.1 million people but the remoteness of the wilderness area was accentuated by the grueling hike and sheer emptiness of the summit. A brief survey of the summit's signature book proved the area to be infrequently traveled. What a pleasant change it was from the urban hustle of Chicago! The trail continues along the ridgeline still gaining and losing substantial elevation before coming to the saddle between Deseret Peak and the unnamed 10,685' summit just north of it. According to the map, this less famous but equally photogenic summit had at least 1,000' of prominence itself making it a worthy side trip. I dropped my pack and continued onwards. 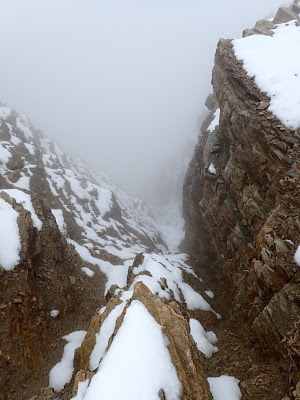 Parts of both the trail and this extra summit are really more of a route than a trail which adds to the adventure. 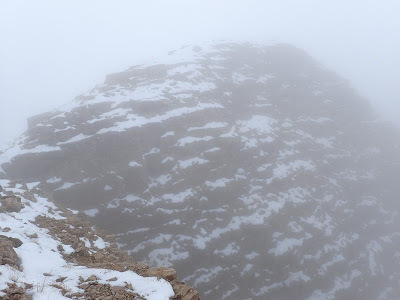 Hoping I would actually come up over the clouds, the second summit of the day was just as foggy. Nevertheless, there was no summit canister and no sign of any human disturbance here which again, added to the allure of this special place. Sunset was just about over when I began the trek back to the trailhead. Making a loop out of the trip was a nice way to make sure I didn't see the same thing twice. I rounded another ridgeline, pictured above and saw the almost-glaciers of the east-facing massif and wondered about a winter ascent. Certainly one could have a lot of adventure with this summit alone. It was almost 10 miles exactly with the added side trip of the nameless peak. Total time was about 9 hours- clearly I spent a lot of time taking pictures or just taking in the view. Although it had been a while since I was last in Utah, I think this place was magnificent even by this state's high standards for such things. By the end of the trip, it ended up being one of my favorite summits. How is the road? Dirt? I was in a tiny compact rental car and was able to make it to the top but most of it is dirt/rock going up. It had just rained too so there were some rockfalls. I wouldn't say I was super comfortable driving the rental that far up but I didn't run in to any problems. No clearance issues.